Check out a visit to Arby’s headquarters by JA Academy participants that recently was featured on GCPS TV’s “In5ive” news program. They have different interests and aspirations but the 9th graders in Norcross HS’ Junior Achievement (JA) Academy have one thing in common… the entrepreneurial spirit that likely will define their postsecondary experience and the careers they pursue. 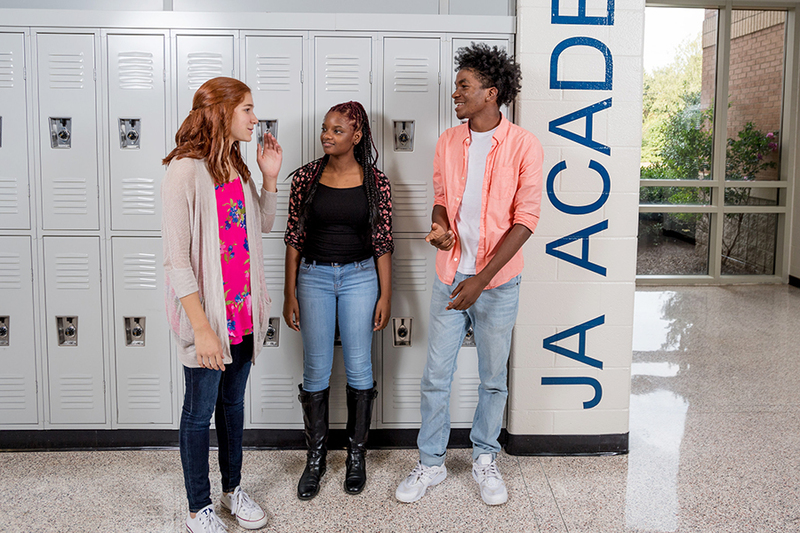 New for the 2016-17 school year, the business-focused JA Academy at Norcross is a “school within a school” that offers an interdisciplinary classroom experience for its inaugural class of 143 students as well as hands-on, real-world opportunities in business management, finance, and marketing. Assistant Principal Kathy Sanchez, who coordinates the program, says additional students may enter the program as sophomores, but most will enter the four-year program in 9th grade. Each grade level will include about 150 students and admission to the program is competitive. (Rising 9th graders just completed the application process for the 2017-18 school year.) Gwinnett's innovative program is one of only two in Georgia and among three in the Southeast. 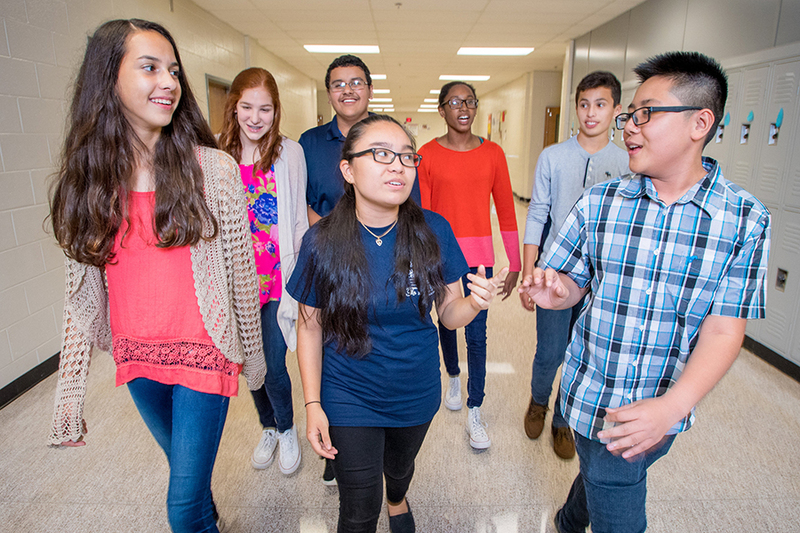 Students take academic core courses (language arts, mathematics, science, and social studies) as well as elective courses and specific career and technical education (CTE) courses during their four years in Norcross’ JA Academy. With the CTE focus, participants can complete high school with credentials in three Career Pathways—Business and Technology, Entrepreneurship, and Financial Services—with the option to complete an additional pathway in Marketing and Management. Students also have the opportunity to take both Advanced Placement and International Baccalaureate courses during their JA Academy experience. “Each month centers around a different theme in partnership with a business,” says Ms. Sanchez. With themes like collaboration, teambuilding, effective communication, decision-making, creatingthe customer experience, and differentiation, the program promotes the skills that a business owner needs to get a new venture off the ground and make it a success. School administrators, Junior Achievement of Georgia, and community partners collaborate on real-life learning opportunities around each monthly theme. Students visit to area businesses, have job shadowing opportunities, work with mentors and professional advisors, attend related seminars, and network with local business leaders and entrepreneurs. First semester partners included WestRock (packaging), Elavon (merchant services), Cisco (technology), and Arby's (food service). One participant, Ayana, points out that her JA Academy experience has opened her eyes about the financial details—from payroll to taxes—that are important to a business owner. She says that kind of focus puts her in a professional mindset as she looks forward to her future career. Kahil agrees, “[The JA Academy program] is shaping my future by getting me used to the business point of view of things. It is showing me the smart way to create my own business or manage one.” His plans call for him to own several businesses after he graduates from college. “Second semester we will be working on the themes of tackling adversity, solving problems and managing risks, and filling a need,” says Ms. Sanchez. Cricket Wireless (telecommunications) and Assurant (insurance) are among partner businesses that will be part of the JA Academy this spring. The students also will complete two major, year-long projects, one on communication and one on a 10-year career and financial plan. Marcus says he’s getting ahead with the learning tools he’s already acquired in JA. Ms. Sanchez says the 21st century skills that students are learning in the classroom and through their business advisors are key to career success, but also serve students well in the classroom today. She says that JA Academy students are engaged in meaningful classroom experiences. As a result, they are in class each day and focused on learning. “We’re definitely seeing fewer behavior issues and better overall class attendance” when compared to the freshman class overall, she says. And, the JA Academy students are passing their core courses at a higher rate. While students are just getting their feet wet in a business-sense this year, during their four years in the JA Academy they will complete an internship during their senior year and launch and build their own venture using time-tested methods in JA’s “Entrepreneurial Incubator” (grades 10-12). John is looking forward to the opportunity to put his skills to work and says JA will help him reach his goals. “I love it because I want to one day own a mechanic shop but I have to know how to run a business,” he says. With the JA Academy experience, John and his classmates will be ready to take care of business in the future.